Everyone wants to save money. But when it comes to a compressed air system, what’s the best way to do it? I recommend looking for inspiration in a nice, big piece of pie. These costs are for a 500 hp compressor, running 3 shifts, 7 days a week, with electricity costs at $0.05/kWh. You can tackle where to focus your energy optimization efforts like you would eat a pie—go for the biggest piece. 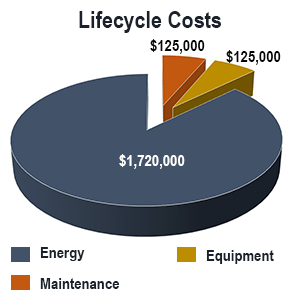 Many people make the mistake of nibbling away at the lifecycle costs pie by slicing and dicing the maintenance costs. This doesn’t work for two reasons—first of all, in the grand scheme of things, maintenance costs are really just a small bite. Cutting those costs won’t have a major impact on the lifecycle cost of the system. Secondly, preventive maintenance is key to ensuring your equipment is running as efficiently as possible and it prevents unscheduled downtime and improves the longevity of the equipment itself. This is not the area you want to try and save a few bucks—it will end up costing you down the road. Equipment selection is also not a place to try and squeeze out some savings. You might pay up front for quality, but chances are, it will last longer and also run more efficiently, saving you money years down the road. Replacing manual and timed condensate drains with demand drains. If you aren’t sure where to start, consider doing a compressed air assessment. A good assessment from a reliable provider can help identify areas for optimization and outline steps for achieving the efficiency gains. Keep in mind that quite often assessment findings make it possible to lower the system operating pressure, which means lower energy costs, less wear and tear on components, and lower maintenance bills. So when it comes to cutting costs for your compressed air system, don’t be shy—go for the biggest slice—and do it with gusto. The improved uptime and reliability you’ll enjoy as a result from optimizing your system will be the whipped cream on top of your deliciously efficient piece of pie. Previous You Want What Where? Good article Wayne! The focus on reducing maintenance costs usually ends up increasing energy costs, not by a little but by a lot. Your life cycle cost graphic supports this relationship well. Thanks, Bryan. Glad you liked it. You are absolutely right about the relationship between maintenance costs and energy costs—it’s one many people miss. If you have any questions, feel free to send me an email (wayne.perry@kaeser.com).